Here we have Jesus participating in synagogue worship on the pattern of his ancestor Ezra. The first six verses of Psalm 19 focus on God’s dealings with the creation; verses 7-14 turn to the subject of the Law. The transition from creation to law has led some to believe this originally was two psalms, but the psalmist seems to be saying that the Law is as natural and necessary for human living as the creation is for the natural world. and one night imparts knowledge to another. and their message to the ends of the world. it rejoices like a champion to run its course. nothing is hidden from its burning heat. and gives wisdom to the innocent. the commandment of the Lord is clear and gives light to the eyes. the judgments of the Lord are true and righteous altogether. sweeter far than honey, than honey in the comb. and in keeping them there is great reward. Cleanse me from my secret faults. then shall I be whole and sound and innocent of a great offense. O Lord , my strength and my redeemer. Paul has just spoken of the “varieties of gifts but the same Spirit” (12:1-11). He reiterates that at the beginning of this section. The Spirit into which we are baptized trumps our ethnic and social differences. We become one body. He then takes off on this image of the body to talk about the diversity that does still exist among us. The body as a metaphor to talk about how the many function as a whole was well known in Paul’s day. A number of Greco-Roman writers used the metaphor to talk about the functioning of the state. Paul makes a bold claim here, however: “You are the body of Christ.” This is beyond metaphor for Paul. It is a new reality created by baptism. 12:12 For just as the body is one and has many members, and all the members of the body, though many, are one body, so it is with Christ. 13 For in the one Spirit we were all baptized into one body—Jews or Greeks, slaves or free—and we were all made to drink of one Spirit. 14 Indeed, the body does not consist of one member but of many. 15 If the foot would say, “Because I am not a hand, I do not belong to the body,” that would not make it any less a part of the body. 16 And if the ear would say, “Because I am not an eye, I do not belong to the body,” that would not make it any less a part of the body. 17 If the whole body were an eye, where would the hearing be? If the whole body were hearing, where would the sense of smell be? 18 But as it is, God arranged the members in the body, each one of them, as he chose. 19 If all were a single member, where would the body be? 20 As it is, there are many members, yet one body. 21 The eye cannot say to the hand, “I have no need of you,” nor again the head to the feet, “I have no need of you.” 22 On the contrary, the members of the body that seem to be weaker are indispensable, 23 and those members of the body that we think less honorable we clothe with greater honor, and our less respectable members are treated with greater respect; 24 whereas our more respectable members do not need this. But God has so arranged the body, giving the greater honor to the inferior member, 25 that there may be no dissension within the body, but the members may have the same care for one another. 26 If one member suffers, all suffer together with it; if one member is honored, all rejoice together with it. 27 Now you are the body of Christ and individually members of it. 28 And God has appointed in the church first apostles, second prophets, third teachers; then deeds of power, then gifts of healing, forms of assistance, forms of leadership, various kinds of tongues. 29 Are all apostles? Are all prophets? Are all teachers? Do all work miracles? 30 Do all possess gifts of healing? Do all speak in tongues? Do all interpret? 31 But strive for the greater gifts. 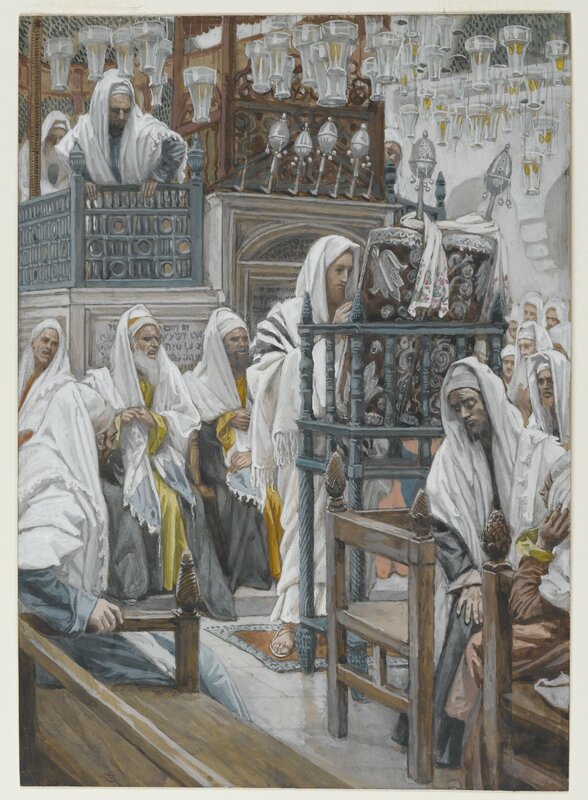 Here we have Jesus participating in synagogue worship on the pattern of his ancestor Ezra. Many things are going on in this text. Luke is continuing to emphasize that Jesus was a faithful Jew. He is also setting up another theme of his, that Jesus is our primary interpreter of Scripture. Jesus is setting forth his agenda, finding it in Isaiah 61:1, 58:6 & 61:2. The interjection of 58:6 is significant in that it is a reflection on Leviticus 25:8-12, the description of the year of Jubilee. The Year of Jubilee was an every 50-year time of liberation from debt and restoration of status (including lost property). For Jesus, this is what being the Messiah means—to fulfill this liberation today. The Scripture quotations (except for the psalm) are from the New Revised Standard Version Bible, copyright © 1989 by the Division of Christian Education of the National Council of Churches of Christ in the U.S.A., and are used by permission. All rights reserved. The Psalm translation is from The Book of Common Prayer. Commentaries are by Epiphany ESources, E. Main St., Hornell, NY 14843, www.epiphanyesources.com , copyright © 2018. All rights reserved. Permission is given to copy for group study, with attribution. © Michael W. Hopkins. All rights reserved. Awesome Inc. theme. Powered by Blogger.